When talking about time travel sequels, I have to bring up my two favorites: “Bill and Ted’s Bogus Journey” and “Back to the Future 2”. Both of these films build upon the previous film, don’t differ in tone, and although to some not quite as good as the first, they find a way to get it done so that it’s just as satisfying to the viewer. 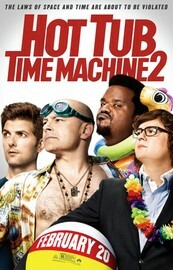 Hot Tub Time Machine 2 fails at all of those attributes. Instead it makes us dislike the characters, grosses us out beyond belief, and makes us want it to end. Part of the first movie’s charm is that it takes place in the 1980s. It has that nostalgia element to it. It’s fun and adventurous. Here, we go into the future where it’s dark and gloomy and makes us want to look away. I’m not saying that they couldn’t have made it work by going to the future. Back to the Future 2 made it work–but we were genuinely invested in what happened and there was some sort of reverence and consistency in the film universe. But within the setting of Hot Tub Time Machine, I think I can safely say that most people would have rather seen the murder mystery plot take place in the past–somewhere that the audience would like to see the characters adapt to. The future setting just doesn’t work. Sure, it provides us with a good murder mystery, but at what expense? Lou (Rob Corddry) learns a lot about himself and grows as a person, but then kills himself off because he feels like his demeanor gets too reasonable and nice. Not to say that this movie doesn’t have its moments, because it does. Adam Scott is a great addition to the film and probably the highlight. I laughed a few times–mostly towards the beginning–but its grossness outdoes its humor, and that’s never a good place for a comedy to be. Although I do give it points for a creative and unpredictable premise, I have to dock it for having too many scenes that drag out for eternities at a time. I’m not going to mention the film’s time travel paradoxes, because I don’t think the filmmakers care all that much. If you like gross out humor, the I guess you’d think this movie is funny. But for most of the people in the world, you’ll see it as a huge drop off from the first.